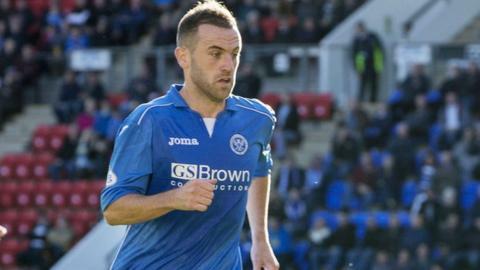 St Johnstone forward James McFadden says he is both "envious" and "proud" of the current Scotland international set-up. The former Everton man scored 15 goals over his 48 caps, including a terrific winner against France in 2007. And the 31-year-old is heartened by the positive start Gordon Strachan's team has made to Euro 2016 qualifying. "Obviously I'm envious because I want to be there and be part of it," he told BBC Scotland. "Since the start of the campaign it's been immense pride for the whole nation. Not only the fact that we're playing well, but it looks good - it's stylish. "We look as if we're a really good side. In Poland, Scotland were excellent and fully deserved to win the game." Scotland have four points from their first three Group D games. After an opening defeat to Germany, Strachan's side beat Georgia and then got a point in Poland. Their next match is at Celtic Park against Republic of Ireland, who drew 1-1 with Germany. "I know Republic of Ireland got a good point against Germany," said McFadden. "But we got a bad point in Poland - we should've won the game and we're disappointed we didn't beat a team who had just beaten the world champions. "Confidence is high; it's a strong group but we'll continue to do what we're good at and I think we'll be strong enough to qualify outright." McFadden, who reckons Scotland will make it to France in 2016, fondly recalls his winner versus the French at the Parc des Princes in 2008. It was during the Euro 2008 qualifying campaign, completing a double over the French, although the Scots fell short of the play-offs. "It seems like a long time ago," he said. "People speak to me about it almost daily and it's something I'm extremely proud of, along with the other goals which other people seem to forget about! "If that's what people are still talking about in 20 years time, I'll be happy to speak about it." "I've got my mind on maybe taking my coaching badges and seeing where I go from there, at some point. But I love playing the game and I feel rejuvenated and hopefully I can put in performances and get back to my old self and play on for years to come." McFadden made his first St Johnstone start in Saturday's 2-1 defeat to Kilmarnock, setting up Murray Davidson's opener. "I did feel tired towards the end but overall I felt pretty fit and I've enjoyed my time here," said McFadden, who signed a short-term deal at McDiarmid Park this month, having been released by Motherwell at the end of last season. "Results haven't been great but you can see a lot of positives and we need a wee bit of luck to get that first win on the board and I'm sure we'll take it on from there. "The club, over the past couple of years, have built success on teamwork. If I can contribute and put my quality into the team then hopefully that reaps the rewards. "Last year I struggled a bit mentally because I felt as though the end was near but now I feel great. I've had a good pre-season and I've rediscovered an appetite for the game and I'm looking forward to getting the club back up the league."